1. Preheat the oven to 200°C, gas mark 6. In a sauté pan, heat the oil and add the meatballs straight from the freezer; fry until browned all over and no pink meat remains. Add the onion and 2 tsp of the Italian mix and cook for a couple more minutes. Stir in the Bolognese sauce and season to taste. 2. 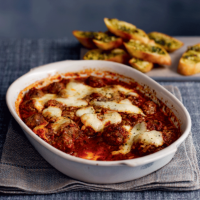 Pour the meatball mixture into a shallow ovenproof baking dish and bake in the oven for 10 minutes. Scatter over the mozzarella and Parmigiano Reggiano. Return to the oven for a further 10 minutes. 3. Meanwhile, bake the bread for half the suggested pack cooking time, then slice and arrange on a large baking sheet. Melt the butter and stir in the garlic and remaining herb mix. Brush each slice generously with the flavoured butter, then bake for 10 minutes, until golden. 4. Serve the meatballs and garlic bread with salad.